Mighty No. 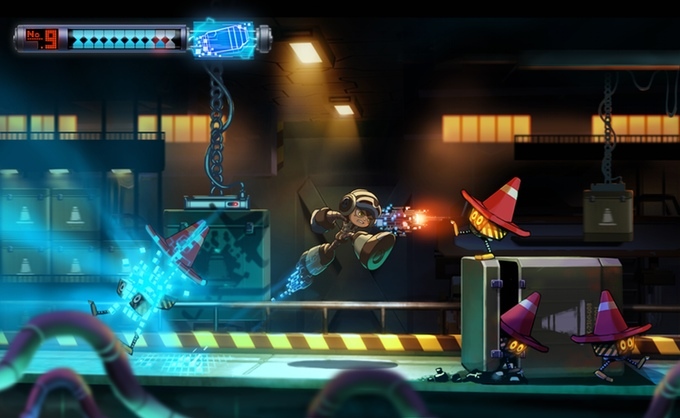 9 started off as a game proposed on Kickstarter back in 2013 by the “the father of Mega Man” Keiji Inafune. 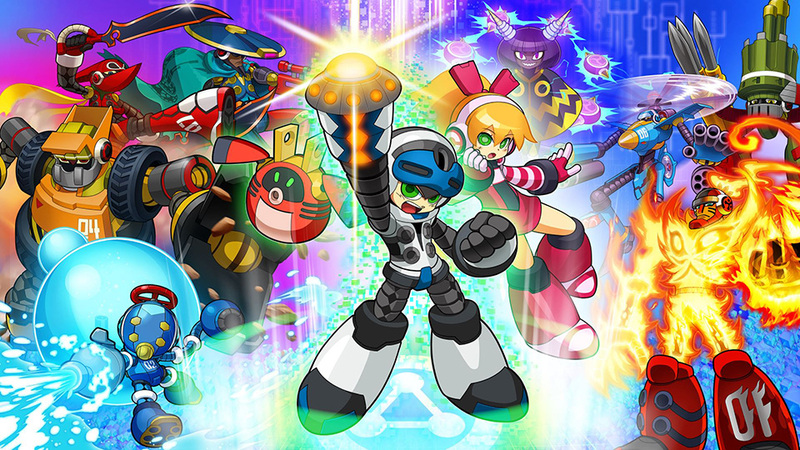 The announcement that Inafune wanted to make a “spiritual successor” to the Mega Man series was met with wild fan excitement and hope. The Kickstarter campaign fulfilled its minimum funding requirement in a matter of two days. By the time the campaign wrapped up, it had increased funds to over 400% of the original goal. Originally scheduled to come out in 2015, production was delayed multiple times. Adding to fan and backer frustration, Inafune’s company, Comcept, started a Kickstarter campaign for another game while Mighty No. 9 continued to spin its wheels. Flash-forward to present day, and Mighty No. 9 is finally playable—sort of. Even the release of the game was bungled as game codes, paid for by backers, didn’t work. Additional stretch goal promises of physical materials have yet to be received, and it should be noted that at the time of this writing, the 3DS versions of the game have been delayed indefinitely with rumors that the handheld version may end up a different game. So, how’s the game that people can actually play? In a word, frustrating. This speaks to both the game as a “final product” as well as gameplay decisions that simply aren’t fun. For starters, the game looks nothing like original concept images that were polished and vibrant. Instead of ushering in the spiritual successor of Mega Man for a new age, graphics look more like they were created for the Sega Dreamcast, a system released back in 1999. Then there’s the difficulty. While Mega Man games have pulled plenty of cheap stunts, resulting in cheap deaths, Mighty No. 9 will go from playable to infuriating at a moment’s notice. There are times when the game is more or less a reasonable difficulty on “normal” and then there are times within a level where you’ll spend a series of lives perfecting a jump or technique, bewilderingly not to be used again in the game. One such instance shows such awful game design as a “hint” pops up reminding you of a maneuver that was never explained in the tutorial and is practically never used again. Even when appearing to follow the correct prompt given on screen, countless deaths follow. It wasn’t until I checked out a video on YouTube, that I was able to figure out exactly where to stand and then slide accordingly. To make matters more time consuming and frustrating, checkpoints appear to be arbitrarily littered throughout long levels. Instead of placing one before a section with drastic difficulty spikes, the checkpoint will sometimes be just far back enough to make you tread through a section that’s not hard, but painfully tedious. Level design aside, the controls are pretty tight, allowing the player to dash all over the screen like a cool futuristic robot. Dashing is critical to Mighty No. 9 as it allows players to destroy enemies and collect buffs that are supposed to help you as you play. The problem is that the concept of dashing through enemies like a cyber-ninja, never quite falls into place and, as a friend noted after playing the game, “it’s like they think dashing is cooler than it actually is.” To be fair, if I had the power to dash like a blur of light, I think it would be pretty cool. On the positive side, bosses are pretty fun and look neat as well. In fact, I never disliked the design concepts of level locations or enemies. Bosses make up an interesting cast of characters that I wanted to play as and see more of. One sniper boss in particular steals the show, representing the creativity and fun Mighty No. 9 could have and should have had. Still, even the slightest amount of fun is quashed in some way or another by the developers. Upon reaching a boss fight, the game froze up on me, not once, but twice; leaving me to wonder if perhaps I’d even be able to progress through the game. The game would go on to freeze later again, forcing me to contemplate whether I wanted to try slogging through a particularly boring level again, or just call it and sell the game back to GameStop. With patience persevering, I did beat Mighty No. 9, feeling mildly accomplished in doing so. The result unlocks additional difficulty levels that I couldn’t even fathom playing on. Having actually bought a copy of the game in stores, rather than backing it on Kickstarter, I was fortunate enough to be able to cut my losses and trade the disc in. Sadly, backers are stuck with no such option. I could go on and on about this game, partly because for everything that’s interesting about it, there’s something that helps make it an utter disaster. When speaking about the criticism of both the launch and reviews of Mighty No. 9, Inafune made the PR mistake of saying “[it’s] better than nothing.” Given all that we know about the finished product; is it? For this review, I played Mighty No. 9 on the XBOX One. I purchased a physical copy at retail for $29.99. Digital copies can be purchased for $20.00, I believe.